I use the word Druidry or the Faery Tradition to honour my ancestors and the beautiful gifts that they left behind for us: the trails of golden light, the treasures and gems hidden in song and story, helping us find our way home. For me, choosing to ‘go abroad’ to find terms from other places and cultures to describe our own indigenous faery traditions can be seen as an attempt to ‘sanitise’ the layers of ancestral karma that overlay the traditions of this land. It is a well known phenomenon that a new in-coming religion has a tendency to diabolise the existing religion. 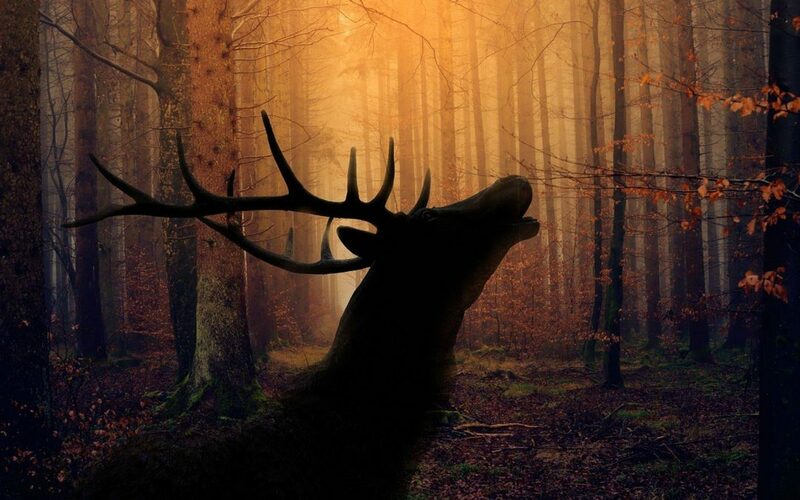 Nowhere was this more evident in the practices of the early Christian church who took the wild beauty of figures such as The Great Stag King, the Lord of the Forest, Cernunnos, Arawn, the Welsh Underworld deity whose totem was the stag. And what of Pan, the goat-man god, a symbol of fertility and fecundity, diabolised as the Christian Devil? And yet who is the figure with antlers atop his head painstakingly drawn into the cave walls at the Trois Frere? What of the May Day rituals such as the Abbots Bromley Horn Dance if they are not reminiscent of the great horned one, himself? All these old figures and practices form part of our own Faery Tradition. The devil as we know him, exists only in Christianity and has nothing whatsoever to do with paganism or shamanism. Those witch-burning times and the early persecution of the Old Religion by the New has cast a long shadow in the lives of women and men as they reclaim their connection to their spiritual roots and remember once again their reverence for this sacred earth and nature. Nathanial Hughes, author of Intuitive Herbalism, spoke in a recent film made of one of his talks, how we would rather buy dried nettle in a tea bag from a shop, then feel the discomfort of going out and being watched by neighbours as we gather herbs for our own larder. Old fears of persecution run deep in our psyches still. I have come across this fear a thousand times both amongst my clients, my workshop participants as well as in myself, fearful of what their developing Sight will bring. I feel it a shame that those who inhabit these blessed isles go abroad to find a word which they feel comfortable using, that feels wholesome enough to describe what our forebears did, a most beautiful oral tradition, handed down through folklore, and myth and seeded in the very rocks, when there are a host of different words that belong to our own earth-based mystery traditions. For me, the Song of our Ancestors runs through our blood and it arises through us from the Soul of the Earth beneath our feet. Knowledge is acquired by journeying to the Otherworld, from meeting otherworldly kin and friends and from trusting our knowing and soul urges. When I encounter beings on my Otherworldly travels, I might then later discover them in myth or legend, described in detail just as they appeared to me in my reveries. sustains me and makes me come alive. It flows through my veins like golden nectar. It is the wellspring of my heart. I am filled, blessed and showered with riches by my communion with the Otherworld, the numinous. Because of it, I am filled with a profound sense of belonging, of joy, an exquisite perception of beauty, gifted with periods of great calm, peace and nourishment. It is my understanding that our soul also feels its ancestry profoundly. I may have had lives in Ancient Egypt, in France, in China, in India all the while perfecting the soul. Those threads may inform me still. But I also have a blood ancestry. I feel it in my bones and I did not begin to feel at home until I understood that the strong Celtic thread that runs through my veins requires expression through my hearthstone, the Celtic Mystery Tradition, the Faery Faith, Druidry. It may be that you have a mixed blood heritage and will feel the call to weave both threads into your spiritual practice to feel fully at home and expressing your mystery. The ancestral traditions of the past were essentially animistic, believing that within all living beings was a spiritual essence or soul. To our ancestors, souls were not the sole preserve of humans but also belonged to animals, plants, nature spirits, first ancestors, deity and faery kin. These Old Ways form part of all the learning in all of the Apprenticeship Programmes run by The Wild Rose Foundation, connecting us deeply through experiential exercises in nature and through shamanic practice as we prepare to develop our Sight in a safe and balanced way.